The WIAA is pleased to announce Highlands Middle School's Eli Brown and Dayton Middle School's Sage Kilts as the May “Give Me 5” Star Students of the Month. 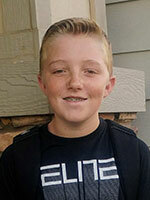 Eli Brown is an eighth grade student at Highlands Middle School in Kennewick, Washington. He participates in baseball, basketball and cross country. Brown is an active member in his school as well, contributing to different school groups and school activities. Outside of school, Brown is also involved Boys Scouts. Participation in multiple sports has helped Brown develop his athletic abilities, especially in baseball. Brown always cheers on his team and supports his classmates who may not have the same experience level. He also recruits others to try out for sports as a way to meet new people and grow his community. Frentzen spoke highly of Brown as a role model in everything he is involved in. His leadership style is quiet and humble, and he leads through positive actions and being a great teammate. 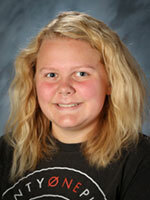 Sage Kilts is an eighth grade student at Dayton Middle School in Dayton, Washington, participating in track and basketball. She also participates in Dayton FFA and 4-H. Kilts has been a positive influence with the younger middle school students, especially with the transition into middle school for the sixth grade students. She learns from all her experiences, and always looks for ways to improve. Kilts is known as someone who is loyal to her teammates, both on and off the court. She demonstrates courage through trying new techniques and being open to constructive criticism. Her sportsmanship and positivity can be seen through her athletic performance, always playing hard while also supporting her teammates and opponents. Although Kilts spreads herself among many commitments, she has grown into a leader in the school and always sets an example for others. Strong went on to highlight Kilts as someone who is well respected by her teammates and teachers. She is unbreakably loyal to her teammates, and is always willing to lend a helping hand to anyone.